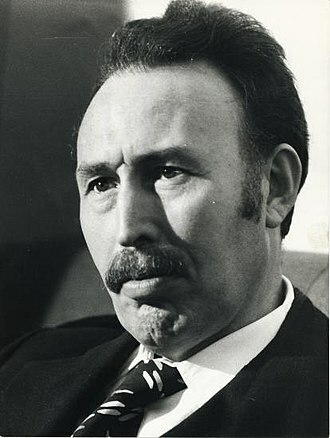 Krim Belkacem was an Algerian revolutionary fighter and politician. Krim was born in the village of Aït Yahia Moussa in the Berber-speaking Kabylie region of Algeria, during the Second World War, he joined the French Army, and was promoted corporal in the First Algerian Sharpshooter Regiment, reputedly becoming an excellent shot. 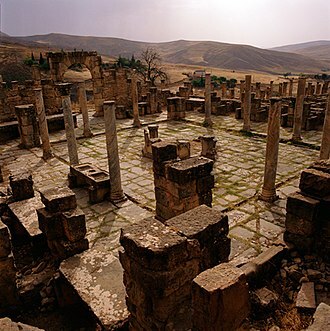 Demobilized on October 4,1945, he returned to his home village, Krim joined the underground Algerian Peoples Party at the beginning of 1946, setting up clandestine cells in 12 villages around Draa el-Mizan. Accused of the murder of a forest warden in 1947, he was hunted and he joined the maquis under the Pseudonym of Si Rabah with Moh Nachid, Mohand Talah and Messaoud Ben Arab. During the Algerian War of Independence, Krim was chief of the FLNs 3rd Wilaya, after his important role at the Soummam Congress—in which the FLN formalized its revolutionary program—Krim became one of the most important and powerful of all the FLN chiefs. 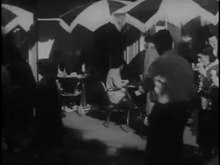 Belkacem, who left Algeria after the Battle of Algiers, formed an alliance with Lakhdar Ben Tobbal, Belkacem was in opposition to the creation of the Political Bureau of the FLN in July 1962 by Ahmed Ben Bella, Colonel Houari Boumedienne, and Mohamed Khider. 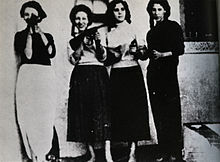 The Algerian Civil War was an armed conflict between the Algerian Government and various Islamic rebel groups which began in 1991 following a coup negating an Islamist electoral victory. By 1996-7 however it became clear that the violence and predation of the Islamists had lost its popular support, the war has been referred to as the dirty war’, and saw extreme violence and brutality used against civilians. Total fatalities have been estimated to be a range of different values from 44,000 to between 100,000 and 200,000, the elections were canceled after the first round and the military effectively took control of the government, forcing pro-reform president Chadli Bendjedid from office. After the FIS was banned and thousands of its members arrested, Islamist guerrillas rapidly emerged and began a campaign against the government. 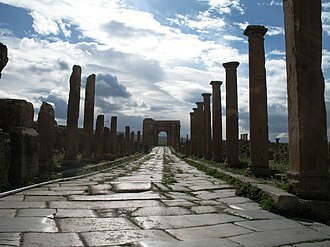 They formed themselves into armed groups, principally the Islamic Armed Movement, based primarily in the mountains. The GIA motto was no agreement, no truce, no dialogue, the MIA and various smaller insurgent bands regrouped, becoming the FIS-loyalist Islamic Salvation Army. After talks collapsed, elections were held and won by the armys candidate, the GIA not only fought the AIS but began a series of massacres targeting entire neighborhoods or villages — some evidence suggests the involvement of government forces — which peaked in 1997. Its massacre policy caused desertion and splits, while the AIS, in the meantime 1997 parliamentary elections were won by a newly created pro-Army party supporting the president. In 1999, following the election of Abdelaziz Bouteflika as president, violence declined as large numbers of insurgents repented, the brotherhoods had been dismantled by the FLN government in retaliation for lack of support and their land had been confiscated and redistributed by the FLN government after independence. Rather than doing this, the worked to promote Islamic awakening as they were fellow travelers of the Muslim Brotherhood and supporters of Saudi Arabia. Al-Ghazali issuing a number of fatawa favorable to positions taken by local radical imams, after persecution by the security services in 1982 he founded the underground Mouvement Islamique Arme, a loose association of tiny groups, with himself as amir. 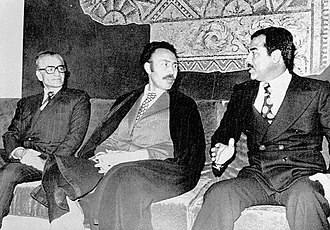 His group carried out a series of attacks against the regime and was able to continue its fight for five years before Bouyali was killed in February 1987. Also in the 1980s, several hundred youth left Algeria for camps of Peshawar to fight jihad in Afghanistan, as Algeria was a close ally of the jihadists enemy the Soviet Union, these jihadists tended to consider the Afghan jihad a prelude to jihad against the Algerian FLN state. 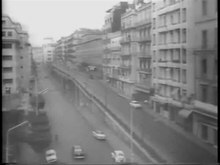 After the Marxist government in Afghanistan fell, many of the Salafist-Jihadis returned to Algeria and supported the Islamic Salvation Front and after the 1988 October Riots Islamists set about building bridges to the young urban poor. Evidence of their effectiveness was that the riots petered out after meetings between the President Chadli Bendjedid and Islamists Ali Benhadj and members of the Muslim Brotherhood. 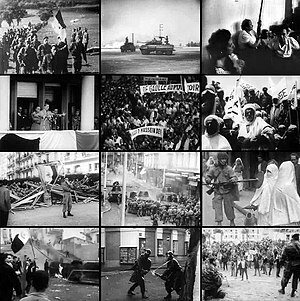 The FLN government responded to the riots by amending the Algerian Constitution on 3 November 1988, a broad-based Islamist party, the Islamic Salvation Front was born shortly afterwards in Algiers on 18 February 1989, and came into legal existence in September 1989. 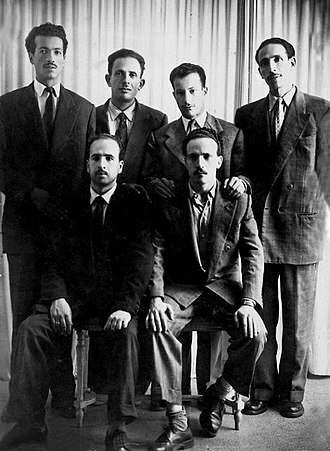 Saadi Yacef was one of the leaders of Algerias National Liberation Front during his countrys war of independence. He is currently a Senator in Algerias Council of the Nation, the son of illiterate parents from the Algerian region of Kabylie, he started his working life as an apprentice baker. 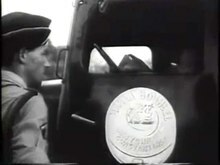 From 1947 to 1949, Yacef served in the MTLDs paramilitary wing, after the OS was broken up, Yacef moved to France and lived there until 1952, when he returned to Algeria to work again as a baker. Yacef joined the FLN at the start of the Algerian War in 1954, by May 1956, he was the FLNs military chief of the Zone Autonome dAlger, making him one of the leaders on the Algerian side in the Battle of Algiers. He was captured by French troops on September 24,1957, Yacef has denied it, and historian Darius Rejali considers the accusation as highly suspect. He was ultimately pardoned by the French government after Charles de Gaulles 1958 return to power, Yacef claims to have written his memoirs of the battle in prison although he was illiterate. 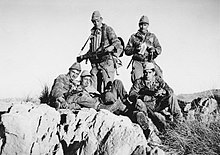 Harki is the generic term for Muslim Algerians who served as Auxiliaries in the French Army during the Algerian War from 1954 to 1962. 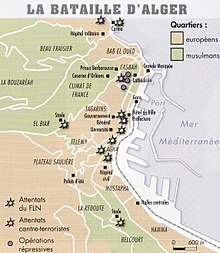 The word sometimes applies to all Algerian Muslims who supported French Algeria during the war, in France the term can apply to Franco-musulmans rapatriés living in the country since 1962 - and to their metropolitan-born descendants. 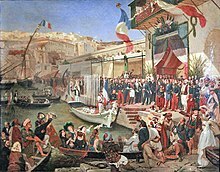 In this sense, the term Harki refers to a social group - a fraction of the French Muslims of Algerian Descent - as distinct from other French of Algerian origin or from Algerians living in France, in 2012800,000 Harkis and their descendants lived in France. French President Jacques Chirac established 25 September 2001 as the Day of National Recognition for the Harkis, on 14 April 2012, President Nicolas Sarkozy recognized Frances historical responsibility in abandoning Harki Algerian veterans at the time of the war. Muslim Algerians had served in numbers as regular soldiers with the French Armée dAfrique from 1830 as spahis. 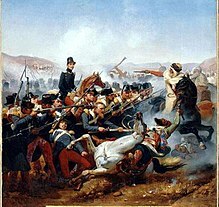 They played an important part during the Franco-Prussian War of 1870 and especially during World War I, when 100,000 died in fighting against the Imperial German Army. During World War II, after the rearmament of the French Army accomplished by the US forces in North Africa in 1942–1943 and they made a major contribution during the liberation of Southern France and in the campaigns in Italy and Germany of 1944–45. 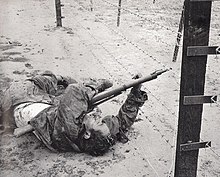 Tirailleurs from Algeria and West Africa fought in Indochina, with the outbreak of the Algerian War in 1954, the loyalty of the Muslim Algerian soldiers to France inevitably came under heavy strain. 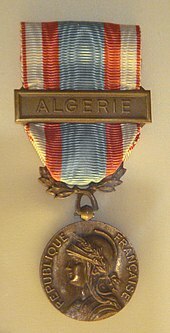 Some of the units were transferred from Algeria to France or Germany following increased incidences of desertion or small-scale mutiny. 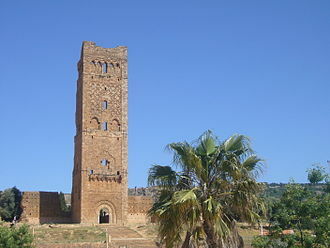 As a partial replacement, the French administration recruited the Harkis as irregular militia based in their villages or towns throughout Algeria. Initially raised as units, the Harkis, from 1956 on. They were lightly armed, but their knowledge of local terrain, according to General R. Hure, by 1960 approximately 150,000 Muslim Algerians served in the French Army or as auxiliaries. 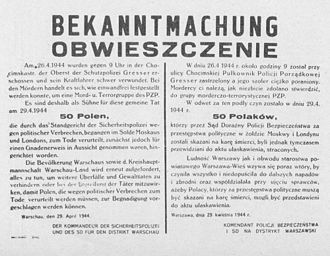 In addition to volunteers and conscripts serving in units, this total took into account 95,000 Harkis. Larbi Ben Mhidi, commonly known as Si Larbi or simply as Ben Mhidi, was a prominent leader during the Algerian war of independence. He is one of the six founding members of the Front de Libération Nationale that launched an armed revolt throughout Algeria, Ben Mhidi initially commanded Wilaya V and played an important role at the FLNs Soummam conference in August 1956. He headed FLN operations during the Battle of Algiers where he was the last member of the FLNs Comité de Coordination et dExécution, Ben Mhidi was a strong believer in that the revolution should be directed by internal rather than external revolutionaries. He was captured by French paratroopers in February 1957 and his death was announced in March 1957 by Pierre Gorlin, Robert Lacostes press officer. 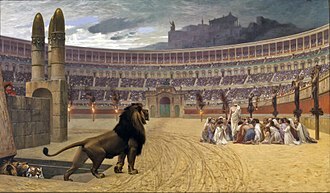 The events surrounding his death were disputed, and contended by many that he was in fact tortured before being summarily executed. Many who knew him, have ruled out the possibility of him taking his own life, in 2000, General Aussaresses admitted that Ben Mhidi was executed whilst in his custody. The exact truth regarding Ben M’hidi’s death remains a mystery to this day, Ben Mhidi is considered to be a national hero in Algeria, and is considered to be a symbol of the revolution that brought an end to French colonialism. Larbi Ben Mhidi was born sometime in 1923 in the village of El Kouahi, Ain Mlila and he was the youngest of six children. The Ben Mhidi family moved to Biskra, where Larbi Ben Mhidi began secondary school, in 1939, he joined the Algerian Muslim scouts, where he became a group leader within a very short period of time. Ben Mhidi became a follower of Messali Hadj and was a member of Hadjs Algerian Peoples Party during World War II, Ben Mhidi was arrested the following day after the Sétif uprising against the occupying French forces in May 1945. 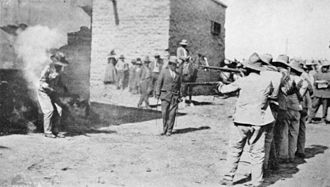 The uprising was suppressed through what is now known as the Sétif massacre and he was arrested in Biskra and imprisoned in the Coudiat prison in Constantine for four months. The massacres committed by the French army in Setif, Guelma, on March 15,1946, Ben MHidi was released from prison due to an amnesty being granted to the majority of nationalists imprisoned for the 1945 riots. Mustapha Benboulaïd, the "father of the Algerian revolution". Youcef Zighout, Abane Ramdane, Ben M'hidi, Krim Belkacem and Amar Ouamrane. Photograph taken in August/September 1956. Ahmed Hussein any plane when he was arrested in pirated.